We love to get books, when my kids were younger I would always read to them. They had a favorite and when I get these cute books I give them to our Liam, my niece reads to him all the time, when he’s older he will be able to enjoy them hisself. Austin lost in America is an adorable And a fun geographic adventure, that’s follows him through the 50 states as he looks for the forever home. 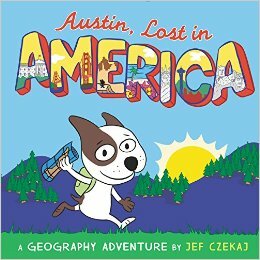 Austin is a cute little Boston terrier, he was living his life in the pet store, till one night he breaks out of the pet store and begins a journey across the U.S., determined to find a real home, with his trusty map and backpack to go in search of it. In Ohio, he is almost bitten . . . by a policeman. In Florida, he is invited for dinner . . . to be the main course. And in Oregon, he finds the world’s smallest park. Will he ever find the place where he truly belongs? Follow him as he sets out on his adventure, this book is packed with so many facts that your child is bound to learn. Besides the little bit of facts here and there many facts about learning geography and have a great time doing so. Along the way, smart readers will recognize clues predicting his final destination. In addition to the narration of Austin’s journey, facts are presented for each of the 50 states. Czekaj’s picture book is full of colorful, energetic images produced in his typical witty style, with laugh-out-loud graphic novel-style scenes from start to finish. A map of the states and capitals is color-coded by region, showing the hero’s tangled route across the country.